Of all the times you can visit Gatlinburg and the Smoky Mountains, fall is an especially incredible time for your vacation. Autumn in Gatlinburg is truly a sight to behold, so we'll let you in on the top 5 ways to celebrate fall in Gatlinburg, TN! 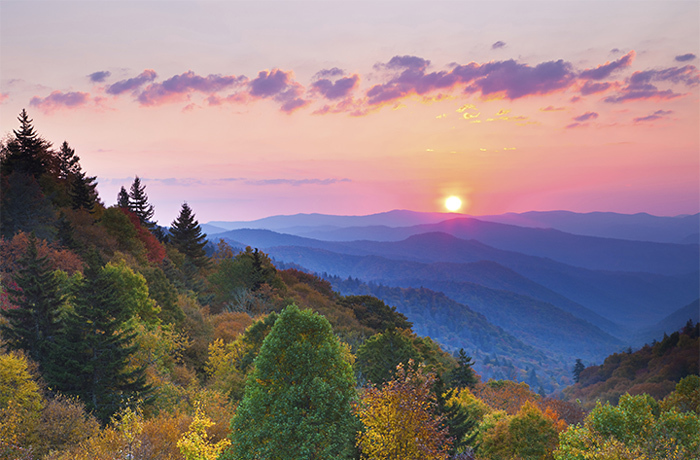 Whether you can only get away for a weekend or if you're planning a longer stay, you won't want to miss these incredible fall vacation ideas in the Smoky Mountains. Why visit Gatlinburg in the fall? Because the scenery is simply breathtaking. October and November are arguably the most beautiful times of year to see the mountains. If you time your visit right, you'll be able to see the mountains engulfed in bright yellows, deep reds, and striking oranges as the leaves change. Making it to the mountains in time for peak fall foliage can be difficult, but luckily there are factors working in your favor. Since peak fall arrives at high elevations first and then descends to lower parts of the mountains, you'll have a relatively wide window of opportunity to see beautiful fall colors in the Great Smoky Mountains National Park. For example, if you're visiting in early October, you'll find the most vibrant colors high in the mountains in places like Newfound Gap, Clingmans Dome, and Mt. Leconte. However, if your vacation date is set in late October or early November, you'll want to explore low elevation regions in the park like The Roaring Fork Motor Trail, Elkmont, and Cades Cove. When the cool winds blow and the days grow shorter, you may start to feel and eerie chill in the air. As October fills our imaginations with thoughts of specters, ghouls, and spirits, there's nothing better than some good scary fun in the Smoky Mountains of Tennessee! From simply strolling the festive streets of Gatlinburg in your costume on Halloween to experiencing "Frightnights" at Ripley's Haunted Adventure, there are plenty of ways to celebrate Halloween in the Smokies! To find your own frightful adventure, consider booking a ghost tour through the streets of Gatlinburg or maybe explore long abandoned cabins, cemeteries, and communities inside the Great Smoky Mountains – if you dare. As the fall season comes to a close, it's time to prepare for fantastic feasts and spending time with the people who matter most. But how can you make your Thanksgiving celebrations even more special? By spending time in the Great Smoky Mountains of course! Many of our guests reserve Gatlinburg cabins for Thanksgiving as a comfortable and beautiful place to celebrate the holiday with friends and loved ones. Imagine having a spacious kitchen perfect for preparing your Thanksgiving turkey feast, a game room for letting the kids run and play, and a hot tub on a deck with beautiful mountain view for your personal relaxation. Better yet, a large group cabin would offer plenty of space for the whole family and enjoy each other's company. Also, if your family wanted something entertaining to do during their Thanksgiving weekend, they could have a blast playing at Gatlinburg attractions or visiting the national park. While it's nice to celebrate Thanksgiving at Grandma's house, why not mix things up and wrap your Thanksgiving into a fantastic stay in the mountains with the people you love the most! Fall is a great time for watching football – so why not see the big game in style in one of our Gatlinburg rentals with a theater room? You can watch your favorite team play like never before in a home theater system complete with surround sound, a 9 FT projector screen, and comfortable theater-style seating. For enjoying delicious game day food, our cabins come with full kitchens and barbecue grills for roasting wings and other snacks. Not only does the fall season bring beautiful weather and gorgeous fall foliage, but visitors will also enjoy great fall festivals in Gatlinburg! Dollywood is famous for celebrating the seasons like no one else can. During this terrific fall festival, guests can enjoy all the rides and attractions of Dollywood outfitted in beautiful seasonal décor. Better yet, this seasonal festival brings in some of the best gospel acts in the country that you can enjoy for free with the purchase of a Dollywood park pass. Celebrate the harvest Bavarian style with traditional German food, music, and beer at Oktoberfest in Gatlinburg! You can enjoy an authentic German-style fall festival while you take in the great attractions at Ober Mountain like ice skating, a mountain coaster, and more. Come see beautiful handmade crafts, live bluegrass music, and live craftmaking demonstrations at the Fall Craftsmans Fair! This annual festival is held at the Convention Center in Downtown Gatlinburg and provides an excellent chance to explore the rich tradition of handicrafts and art in the Smokies. We hope this list of ideas will help take your Smoky Mountain vacation in Gatlinburg to the next level! But we'd also love to hear how you want to celebrate fall in the Smokies? What was your favorite autumn activity in Gatlinburg? We'd love to hear about your stories in our comments section. 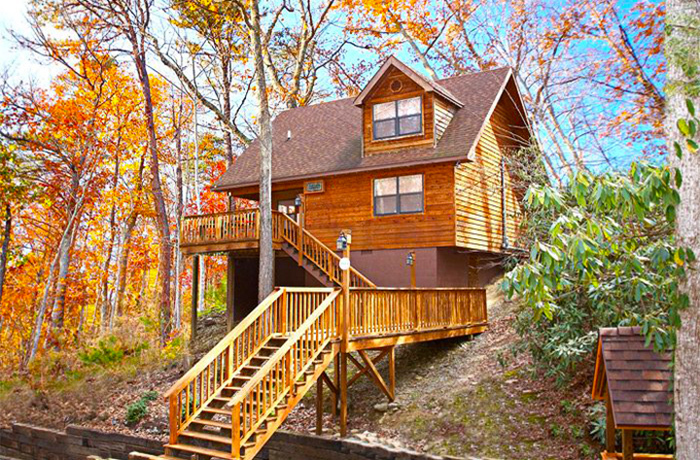 Also, if you've never experienced fall in Gatlinburg and you'd love to plan a trip, browse some of our affordable Gatlinburg cabins. Our helpful reservations staff would also be glad to speak with you if you call (865) 436-5031 today!